"I'm thinking about taking a year off from teaching next year," I said to my principal with tears in my eyes. When I first started teaching four years ago, I couldn't imagine myself doing anything else. When people asked me how long I intended to teach, I would always look at them like they were crazy and tell them I was going to keep teaching until I was old enough to retire. For me, teaching wasn't a temporary thing or a step on the ladder to some bigger and better career. Teaching was a calling. So how did I end up in this place a few months into the school year? To give you some background, I teach at a pretty small school, with approximately only 60 students total from Pre-K to 5th grade. Yes, you read that correctly. 60 students. As you probably figured, there is only one teacher for each grade level because most classes have no more than 12 students. Teaching at such a small school allows me to know exactly who is going to be in my class the following year. Last summer, I knew I had a challenge ahead of me. I was getting the class that has by far the most behavior problems of any class at my school. Although classroom management has always been a struggle for me, I was determined to do my best and to build relationships with these students. 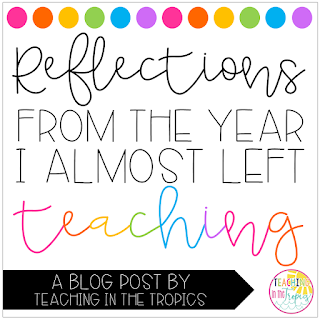 I even wrote a blog post at the end of the summer last year detailing the journey I had been on in my faith and sharing my desire to show the love of Christ to my students in the upcoming school year. I felt like a failure. All of the behavior issues, additional paperwork, and personal stresses had started to take a toll on me and I came home feeling tired every day. I felt myself beginning to lose the joy and zeal I'd had for teaching since the day I stepped into my first classroom four years ago. I began to wonder if this was God's way of telling me to step away from teaching for a while. And so that day came, when I broke down in my principal's office - something I had never done before - and told her about my struggle and the doubts I was having. She is the sweetest and most supportive principal anyone could ask for and of course told me she wanted me to stay, that she knew I would get through this and was willing to support me in any way she could. Shortly after that, I began doing a Bible study with a group of women on the Fruit of the Spirit. I learned so much through that study and began to see a purpose in everything I had been going through. Even though I had been on a spiritual journey of sorts since April 2016 and could see evidence of God's transformation in my life, there were many areas I was still lacking in. One of the points from the Bible study that stood out to me when we looked specifically at patience was that we need those people who test our patience. And oftentimes, God places those people in our lives to show us that we're not as mature as we think we are, so that we can become aware of what we lack and where God needs to work in us. This realization made me look at my struggles with my students in a completely different way. You see, during a time in my life where it would have been easy to look back at my spiritual growth and become self-righteous, God gave me exactly what I needed. He showed me that there were areas of my life that I needed to surrender to Him in order to bear fruit. He showed me that teaching - the one thing in my life that I always thought I could do on my own - was something that would be impossible for me without His help. One of the things I've always loved about teaching is that while we're teaching, we're also learning. In fact, teaching is a career where we never stop learning. 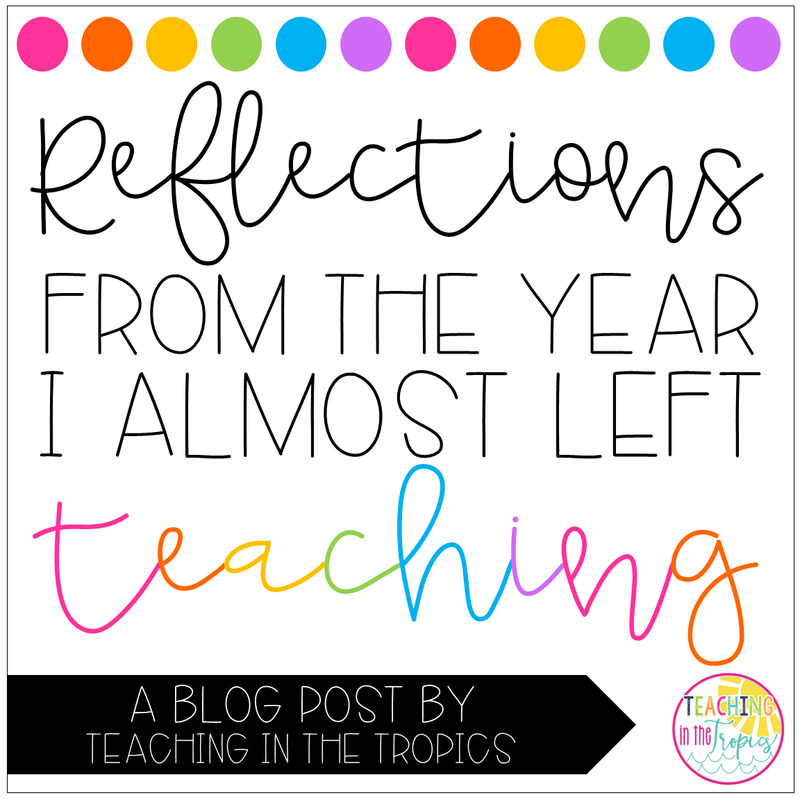 This year, I think I learned more than I have any other year. I learned that God's grace is sufficient (2 Corinthians 12:9), that His mercies are new every morning (Lamentations 3:23), and that He is working all things together for my good (Romans 8:28). I learned that although I may fail, He never does. In every trial, He has a purpose and He will complete the good work that He has started in me (Philippians 1:6). It's not easy to be a teacher but that last paragraph you wrote hit me with such encouragement. As a teacher, I can completely relate and God bless your Principal for being so supportive!God will always give you help when you need it! Stay strong! Thank you, Patsy! I truly appreciate you taking the time to read this post and leave such an encouraging comment. I am glad you were able to relate to the post and found encouragement from it. Yes, I am very thankful for my sweet principal. And you are absolutely right - God is our help and refuge, and always gives us what we need at just the right time. Hope you have a wonderful school year! Thank you for sharing this post! I love the scripture you shared. It was the exact post that I needed to read!